Yesterday, my middle son Nate, affectionately known around here as the pickle in the middle, turned eleven. I don’t know what conventional birth-order wisdom says, but of my three kids, I think of him the most as my baby. The true baby, Andrew, has spent his entire life trying to keep up with his two older brothers, so he always seemed older than his years to me. But my Nate embodies real old school childhood — he is still filled with unabashed little boy enthusiasm over bubbles, balloons, puppies and whoopie cushions. He doesn’t try to pretend he’s too cool for anything, and he loves with his whole heart. Nate is such a joy and has taught everyone in our family so much about what’s important in life. I am so lucky to be his mom. Our traditional family birthday cake is this one. Nothing fancy, but a very decent chocolate cake suitable for birthdays. I do, however, try to mix things up with the frosting. This year Nate requested chocolate frosting, and I was excited to find one which seemed slightly higher quality with more complex chocolate flavor, yet ridiculously easy. The most exciting part is that it’s made in the…are you sitting down?…FOOD PROCESSOR! What a genius idea. I know I don’t get out much, but this blew my mind. This frosting requires a decent quality unsweetened chocolate with the highest percentage of cacao you can find. 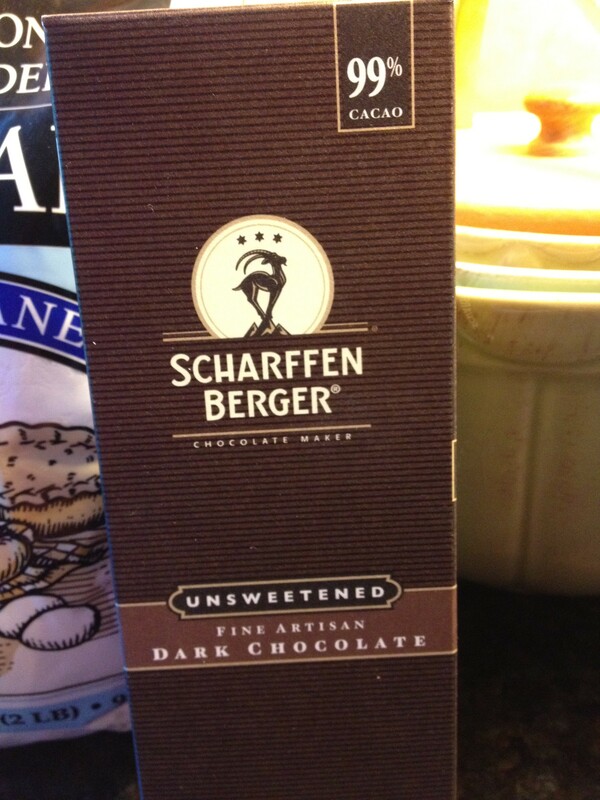 I used Scharffen Berger dark chocolate with 99% cacao. When you are using chocolate of this caliber, I suggest you melt it slowly in a double boiler rather than a microwave. 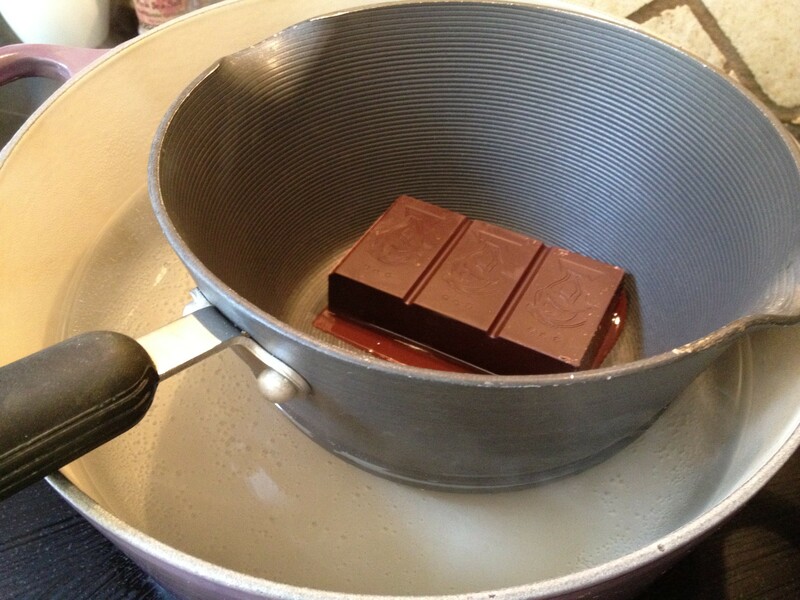 You don’t need any fancy equipment to fashion a double boiler, just a small pot placed in a larger pot. This link explains the technique in case you’re unfamiliar or intimidated. Don’t be! It’s worth the ten minutes of extra effort. This frosting had an incredibly smooth, spreadable quality and rich, complex flavor. I have more than enough to frost a double layer cake (three sticks of butter, yo) and I did wind up throwing quite a bit of it out, unfortunately. Damn diet. Another trick I learned is to put aside 1/4 to 1/2 cup of the frosting BEFORE you incorporate the chocolate, and that way you can tint it or leave it white for decorating, and you’re not stuck using that icky toothpastey stuff to decorate with. Place all of the ingredients except for chocolate in a food processor and pulse to mix, then process until the frosting is smooth. Set aside a small amount of white frosting if you are using any to decorate. Add cooled chocolate and process until well incorporated, scraping occasionally if necessary. Frost your cooled cake with reckless abandon, and give your birthday boy or girl a big kiss! 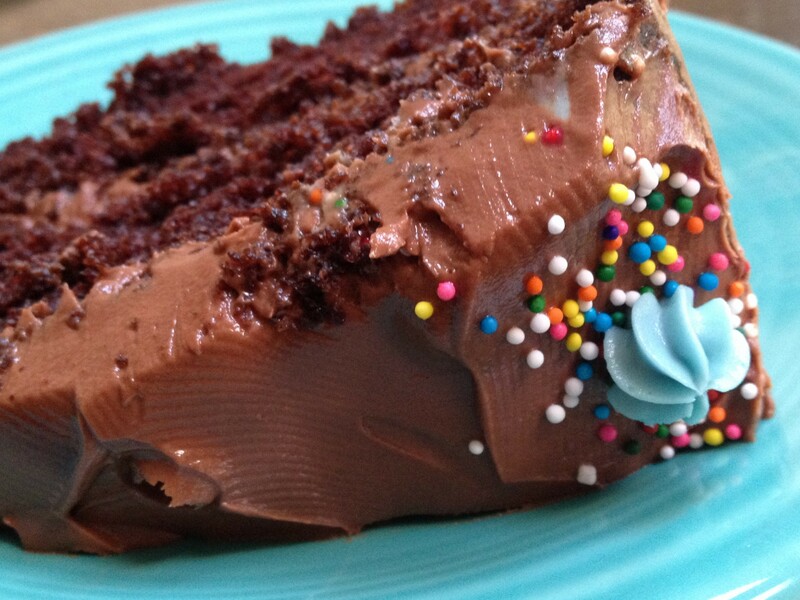 This entry was posted in Desserts and tagged birthday cake, easy fudge frosting by Mom Mom's Apron. Bookmark the permalink. We can’t wait to see you, Gin! Yes, you’re right, very hard to diet. I haven’t cracked yet, miraculously.